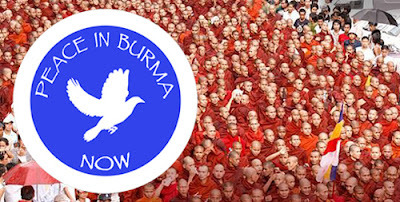 TBF: The Burmese monks have demanded the military junta to apologize for the killing and insulting of monks and the religion not later than October 2, 2009 or face the consequences of excommunication starting on October 3, 2009. How is the situation inside Burma now? Ashin Issariya: The situation is extremely tense because the Burmese government is obviously afraid of the monks. They fear, that we monks might start walking again, might build a movement again and initiate a revolution. That is why today the Burmese monks are followed, restricted and controlled so much. In this situation a lot of monks are on the run, hiding somewhere, having changed their robes to laymen clothes. Some monks left Burma and came to Mae Sot, Thailand. Yes, some monks had run away from Myanmar because of the harsh persecution. Today, many monks are engaging themselves with politics for the sake of our country. These monks don’t care if they get arrested or not. The government is very afraid of these monks. Its because of these Burmese monks’ dedication to offer their lifes for the freedom of our country, that the Burmese government is so afraid of them. One of my friends just told me: “It doesn’t matter if we get killed or not, we offer our lifes for our country.” We, this includes myself, offer our lifes because we can’t accept the ruling of the military junta in our country. As you know a lot of monks are already in jail. And they are our friends. We feel a great responsibility to help them, to protect them, to try to get them released from the prisons. All Burmese monks share this concern. It is our responsibility to free the monks from the Burmese jails. TBF: In an amnesty the military junta released 7,000 prisoners including 128 political dissidents and of them only 4 monks, what do you think about that? Ashin Issariya: Yes, only four monks were released, which is extremely bad. On the contrary, they have meanwhile arrested another ten monks, although we don’t know who they were. This means, we only now about ten monks imprisoned lately, but the police has, actually, captured many persons. However, we don’t get any information on their identities. In our country most people are uneducated, which makes them especially vulnerable and insecure. These people are extremely fearful of the government. If someone gets caught and sent to jail, they don’t now what to do. This also very often applies to the families of our monks who don’t now what to do for their imprisoned sons. Usually, the most they are informed about is, that the police has caught their son but nether where he was sent to, nor what they could do for him right now. Like this, you see, we have no information about identity and whereabouts of the lately arrested monks. And even though they have released a lot of prisoners last week, only a few political dissidents were among them. I think this is an ill lead message and definitely a big mistake. They have released all kind of criminals like thieves and murderers, who, being free again, could now steal more and continue to kill. These criminals are the ones, who should remain in the jails. But instead the political dissidents are still imprisoned. They should not be there. These persons are trying to help our country in a peaceful way. This is all wrong. We feel so sorry for them and we promised ouerselfs to do everything we can to help release all political prisoners. TBF: Do you think that from Germany, Europe, the USA or any other part of the world we could help you somehow? Ashin Issariya: Of course, you can. Now inside Burma a lot of monks are traveling around, sharing pamphlets, which is extremely dangerous. I try to support these monks but sometimes I simply have not enough money to really help. This is a real problem for me, especially because from inside Burma a great number of monks, ordinary people and students are trying to get in touch with me and asking for support. My possibility to help is so limited, it’s simply not enough. I want to tell the world: Please, remember that we are all humans. The people in our country are humans like all other people in the the world. And as humans we have a responsibility to protect other humans and to protect our valuable human rights. In our country, for example, the military government kills innocent people, they even kill the most peace loving monks. This is a major problem for us, for our country, but also for the world. Other countries should help us, but not by issuing statements alone, not only help with words. 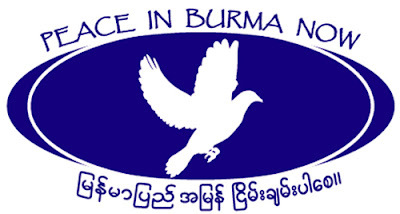 The Burmese military government is not afraid of words. What we need are clear guidelines. The leaders of other countries should tell our military government: You have to follow these guidelines! If you don’t obey our exigencies there will be consequences! And, of course, these kind of statements have to be followed by action. But the United Nations don’t act. Take, for example, the way the UN behaved at the time of Cyclone Nargis. The United Nations declared to have a program and to be able to help. But that was not true. I was inside Burma at that time. The United Nation’s couldn’t help the Burmese people. These people lost everything, they had no food and no money. Most of the population affected by Cyclone Nargis were farmers and fishermen. Neither the government nor the United Nations helped them. Of course, at that time the news was spread around, that help would come. So a lot of people expected help from Than Shwe or from the UN. But the United Nations gave the food to the military government and they only used it to pose with this food for some fake pictures. After that the food was stolen and sold by the government. It never reached the people. This is the way, thinks are managed under the Burmese military junta and that is not good. Or take the behavior of the USA in the Daw Aung San Suu Kyi case. They laid great emphasis on protecting their citizens and demanded, that Mr. Yettaw should be released, what happened soon in fact. But our leader Daw Aung San Suu Kyi remains under house arrest. The USA government always claims to understand the impotency of Human Rights and that they want to help us bring a peaceful democracy to Burma. But that is only talk. They don’t act like that. Instead of only trying to release their own citizens, they should do more to help release Daw Aung San Suu Kyi. We don’t like the way, they act. TBF: On the two-year anniversary of the monk-led September mass demonstrations, Burma’s military junta has tightened security in several cities around the country. Security forces were deployed along main roads and near major monasteries and pagodas. I read the monks can only go out in groups not bigger than five persons. How can you under this circumstances go out and demonstrate again? Ashin Issariya: That is right, if more than five monks walk out, they will get caught and face to be asked a lot of questions. Questions like “why are you going outside in a group?” Sometimes even alone walking monks are stopped and intensively interrogated. Now, if the monks walk out in a group larger than five they are questioned like: WWhere are you going? Why are you going to the pagoda?” Sometimes the monks are also called to the police offices to be interrogated there. How to walk out on the streets under such circumstances is of vital importance for us. We think about this a lot. For, clearly, the government is trying to stop our action. We will have a ceremony at a big monastery for Pavarana Day. This day is the end of the rains retreat with many monks attending to confess their violations of the disciplinary rules to another monk or to the Sangha. At that time a lot of monks will be together at one place, one monastery. The lay people gather to make formal offerings of robe cloth and other requisites to the Sangha and in this situation the monks will reject all offerings of the military. We will declar to them, that we from now on boycott them. We don’t accept their programs. We ask them to apologize to us and to release all monks from the Burmese prisons. If they don’t obey to that, we will turn our bowls and practice the Pattanikkujjana. We will march – if they try to stop us or not, doesn’t matter. We will sit in mediation and we will recite the Metta Sutta. We will ask all people to join our protest.